"In our studies of landscape we are very frequently made the victims of either illusion or delusion. The eye or the mind deceives us, and sometimes the two may join forces to our complete confusion. We are not willing to admit different reports of an appearance." A Desert Guidebook is a digital companion to exploring the American desert. Comprised of photographs from the archives of The Huntington Library, this online exhibition su​rveys the enduring sense of wonder and fascination sparked by the deserts of the West. The desert—as a beautiful, yet formidable environment—is a historic test site for both human progress and failure. The desert thereby confounds efforts to view it as a simple totality, because it emerges as a contradictory setting of achievement, innovation, and leisure as well as ruin and abandonment. ​The exhibition draws out the tension that exists between the appearing desert, or the landscape that manifests into view, and appearing deserted, or the foreboding expansiveness of this environment. These poles only provide partial views of the desert. This is a key characteristic that this exhibition locates in a series of some three dozen photographs taken from the late-nineteenth through mid-twentieth centuries. The photographs featured in A Desert Guidebook document arid topographies as either emerging from the landscape or fading into its seemingly boundless terrain. The exhibition presents the unexpected trappings of the desert landscape in the format of a critical guidebook. Included in this compendium are vernacular photographs showing how-tos and whatnots for exploring the American desert: legends for interpreting the symbols of the landscape, maps for navigating the terrain, etiquette for visiting the desert, and methods for appearing to leave no trace behind. While human sojourning amidst the arid landscape is a thread linking these various themes, the individual galleries delve deeper into the peculiar mirage-like illusiveness of the American desert. "What is it that draws us to the boundless and the fathomless? Why should the lovely things of earth - the grasses, the trees, the lakes, the little hills - appear trivial and insignificant when we come face to face with the sea or the desert or the vastness of the midnight sky?" These qualities should not be taken as indicative of blankness or confusion. The appearance of the desert, like the sea or midnight sky, simulates the optical uncertainty of the mirage. A Desert Guidebook sees the appearing desert and appearing deserted as implicitly part of Van Dyke's encounter with the arid landscape's multiple views and perspectives. This mirage-effect makes the desert simultaneously strange and familiar. One can gaze upon the monumental density of desert rock faces, boulders, and mountain backdrops. But this stable view is unexpectedly interrupted by the atmospheric play of light on matter, which turns rock into a refractory surface for sunlight and the multi-tonal complexity of desert flora. The interplay of earth, sunlight, and air produce the optical illusion - or delusion - of the desert: it as a surface that has no bounds and no explicit means of interpretation. This is precisely why different "reports of an appearance" exist in the desert and why this landscape sparks fascination distinct from any grassy plain, thick forest, river and lake, or hillside. The four galleries of A Desert Guidebook weave together multiple "reports" highlighting the American desert as a historically contested site, specifically as an aesthetic ideal, as a space for gendered ideology, as a built environment, and as a place filled with human traces. During the course of your journey, this exhibition hopes to activate mirages in its photographs and, in turn, foster the unexpected in the boundless and fathomless landscapes of the American desert. 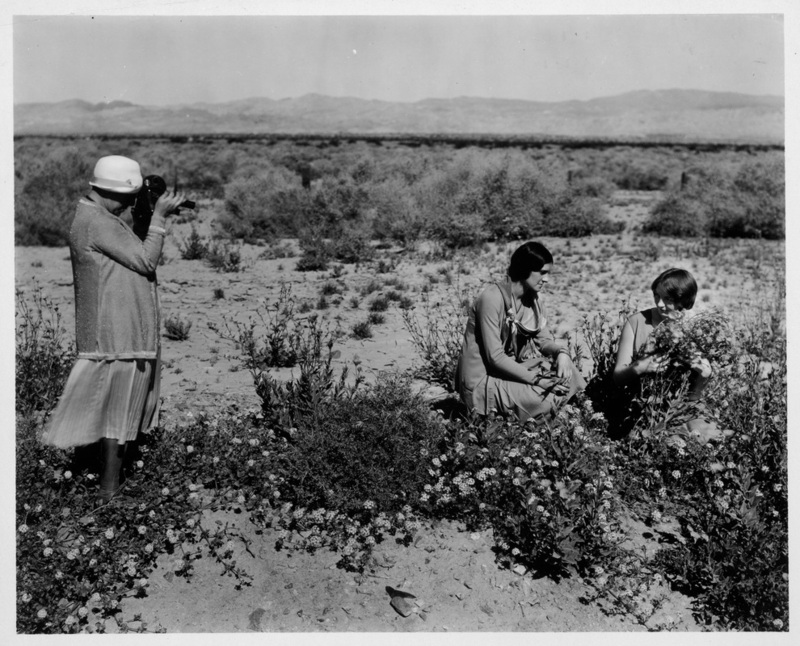 A Desert Guidebook is supported by the University of California, Irvine's Humanities Commons and Desert/Structure/Modernism Research Cluster, and The Huntington Library, Art Collections, and Botanical Gardens.